Once you have done all you can to improve the efficiency of your home through insulation and heat loss reduction, you can start to think about the way you are heating your home. A homes heating bill is typically the biggest utility bill we have to pay, so anything you can do to reduce this cost will be well worth it in the long run. 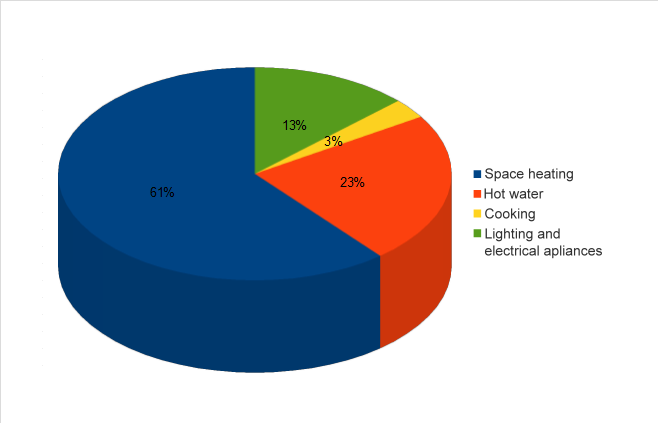 The average home will use around 61 per cent of it’s total energy for heating, with 23 per cent used to generate hot water and the rest spread between cooking, lighting and appliances. Being able to control the way the heating is used in your home, and to regulate temperatures of both space and water heating, is the next step to consider if you are trying to create a greener, more efficient home. Upgrading the controls or learning to use the ones you have more effectively will make a big difference to your energy consumption and costs. 1. Room thermostats: These should be placed on a wall in the main living area, but away from any draughts, heat sources and not blocked by furniture. Temperatures of around 18 degrees are suitable for most households, although those with elderly residents or young children may find up to 21 degrees more comfortable. Putting in a room thermostat where you didn’t have one before can save you up to £70 per year. 2. Thermostatic radiator valves (TRV’s): These are thermostatic valves fitted to individual radiators. They control the flow of hot water through the radiator, dependent on the air temperature around them, making them ideal for controlling heating in individual rooms. 3. Cylinder thermostat: Your hot water cylinder should also have a thermostat. If you find you are constantly needing to add cold water to the hot water supply, to make it suitable for use, you can probably save a great deal by turning down your thermostat. If it has a temperature guage on it, around 60 – 65 degrees is usually optimal. If you don’t have one at the moment, installing a boiler thermostat can save you around £30 per year. As well as this, you should have a timer or programmer for your central heating. You should make sure this is fully functioning and that you know how to use it properly. Electricity is the most carbon intensive and expensive way to heat your home. If you have storage heaters, then a highly recommended consideration is to change this to a boiler and radiators, a heat pump with underfloor heating or a biomass system. If you are not ready to replace your storage heaters yet, you should ensure you are familiar with the operation of the ones you have to ensure you are not wasting money. If you have no option but to live with storage heaters, replacing older models with new, more efficient, fan assisted models can help you save money. As with all Green Deal improvements, your first port of call should be to have a Green Deal assessment from an approved assessor. You can search for an assessor here, or can contact a Green Deal Provider and ask them to find an assessor for you. They will present you with an Advice Report, which will indicate where your priorities lie, along with estimated savings achievable through the improvements. This entry was posted in Energy Efficiency, Grants / Funding, Green Deal. Bookmark the permalink.